Saito Bloodline Ninjitsu (Saito Ninjitsu) is the most spiritually complete and powerful of the martial arts. It encompasses a vast amount of teaching and training in all areas of martial arts, as it was handed down in the Japanese Saito family bloodline after 2000 years of development. It will compliment and surpasses any other martial art, and on its own is all the training ever needed. There is nothing missing. It is not a sport. It is the real martial art - The authentic teachings. "Saito Ninjitsu - It is Krav Maga on steroids & Much, much more." - Mark W.
Saito Ninjitsu was a closely guarded secret, not taught outside the Saito clan until 1966. The great Grand Master Mark K. Saito, Sr. gave the exclusive authorization to his son, Master Maui Saito, to teach Saito Ninjitsu publicly, and with his father's blessing, to preserve and pass on the art for those deserving. Grand Master Mark K. Saito, Sr.
Saito Ninjitsu, as Grand Master Mark Saito, Sr. would enforce, was always strictly intended to be taught for the protection of the innocent and oppressed - to surmount against all odds - for purposes and intents that are ethically and morally on high ground. He would declare the motto, "Peace at all cost." And was quoted saying, "Listen to that small voice; it is your inner soul... The goal of Saito Ninjitsu is peace!" Saito Ninjitsu goes beyond purely physical training and involves the necessary education and Mastery in using the hidden "magical" powers to overcome enemies that we would have incorrectly perceived to be more powerful. Saito Ninjitsu is a way of life. It has a very unique Japanese history. It was for a long period of time a martial art secretly practiced by the Saito clan's for protection against marauding warlords and ronin, and through history the Saito's art and skills for those that knew were revered. The ancient and spiritual legend describes how the Saito clan were given the gift of the Saito Ninjitsu by the "Shorinjin," or immortal man. "I've compared what we are learning with what others have learned from other teachers, and it's just not comparable. We are learning to do things the exact right way, from the very beginning..." - Steve B. "...[This] ancient Japanese martial art has a spiritual component to it. I have to say, that is a very intriguing aspect of Saito Ninjitsu as well." - Mark W.
men, women, youth, law enforcement, and all backgrounds. Saito Bloodline Ninjitsu - Full training from start to Black Belt, including Japanese Jujitsu for BJJ, and an education encompassing over 40 separate martial arts. Black Belt Saito Bloodline Ninjitsu - Saito Ninjitsu Mastery, including Certified Instructor Training Program. Weapons and Swords - An integral and fun part of Saito Ninjitsu Training. Law Enforcement Training - The best there is. Private Lessons - A great opportunity to advance quickly. Master Maui and Sensei George... "Ouch!" "What a great place to learn the martial art of Ninjitsu. Master Maui and Sensei Daron are GREAT teachers, the way they teach with knowledge and ease makes it a great learning environment... They are patient and work with you and make sure you understand what you are doing. They make you feel at home..."
Saito Ninjitsu is an actual combat tested martial art for real self-defense, and real life deadly situations. Master Maui Saito was taught Saito Ninjitsu in it's complete form, in direct line of decent, with all the knowledge that was originally contained in the art intact from before Japan's peaceful Edo era, when Japan was rife with war, before the restrictive Meiji era. The lack of martial arts masters able to teach the highest forms of Japanese martial arts is due directly to the effect of the Meiji era in Japanese history when the Japanese government placed severe restrictions on the practicing and teaching of martial arts in all their most dangerous and deadly forms. Master Maui Saito's family clan already had a long history of secrecy with their art, and therefore Saito Ninjitsu continued to be passed on despite the edict. 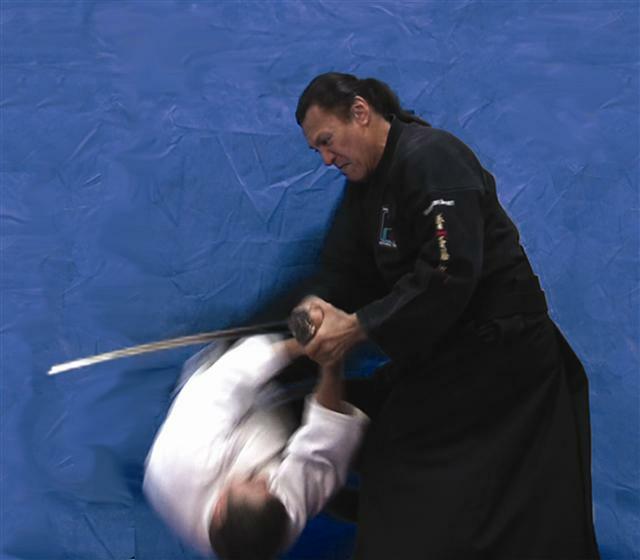 Master Maui Saito received the training that his ancestors had honed to a science for two millenniums of Japanese warring history, and teaches Saito Ninjitsu, complete with its more than 40 separate arts from combat arts of Japanese Jujitsu (methods of combat using indirect force) to combat arts involving weapons. He bears a great honor to pass on the gift of Saito Ninjitsu to the world. "I am not one to post a lot of reviews, and when I do I am brutally honest. So with that in mind, I have to say that Maui Saito Ninjitsu is by far the best and most unique program I have ever seen..." - Scott G.
"I am very very impressed... I love it there and can't wait for the next class to be back for more. You are always learning different things in each class so its never boring..."
Although the other Saito Ninjitsu classes will integrate weapons from time to time, this class will focus solely on weapons and swordsmanship. Some of the weapon training will be Nunchukus, Sai, Tonfa, Bo, Shinai (bamboo sword), Boken (wooden sword), and Iaido (samurai sword). Tengu double sword fighting will be taught to our advanced students and teachers. In the old days our family called it “The Invisible Sword” because it spins around your body and it is hard for the enemy to defend himself against it. The sword is a different animal, a weapon that no one has ever seen. The sword was never drawn unless a life was to be taken, therefore no one lived to tell about it and its secrecy remains. “Safety First” is implemented in all of our weapon training. "...how often do you get the chance to train with a true Master? It's actually pretty rare."